This corded necklace is made using satinique cording. The length can vary from about 16 to 19 inches with a center jeweled piece that adds just over 3 inches. It is done in a milk chocolate, ivory and mint green. The jeweled piece starts with a small adventurine round and a larger amazonite round, with a brown shell disc in between. 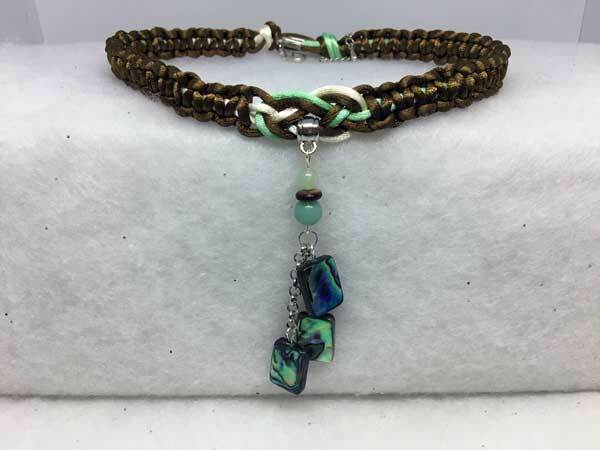 Hanging from that are 3 gorgeous rectangle beads layered in abalone shell on both sides, hanging from varied length silver chain.